The state of California spends approximately $3.8 billion on prescription drugs each year. These drugs are purchased for Medi-Cal patients, state employees and prisoners. Medi-Cal is the program that provides health benefits to low income Californians. Medi-Cal and other state agencies negotiate with drug companies to try and make sure the state is getting a good deal. The United States Department of Veterans Affairs (the VA) buys prescription drugs for military veterans. The national VA often gets a better deal on drugs than the state of California. Limit the amount the state could pay for prescription drugs. State agencies would not be allowed to pay more than the Department of Veterans Affairs pays for a particular medication. Prop 61 would apply to most state agencies, except the state’s “managed care system,” which covers 75 percent of people on Medi-Cal. The state would also regularly check to make sure drug costs weren’t higher than those paid by the VA.
How much the state could save depends on many factors. It is not always clear exactly how much the VA pays for medication. Sometimes the VA works out special pricing with drug companies that is not made public. The state may not be able to find some of this information. Drug companies also might raise prices on the VA in response to Prop 61, or refuse to offer the state the lowest price. Prop 61 would make sure California is not paying too much for prescription drugs. Prop 61 could save the state millions or billions of dollars in healthcare costs. Prop 61 would not apply to 88 percent of state residents, including most people on Medi-Cal. Prop. 61 would remove discounts the state currently receives and would increase healthcare costs, not reduce them. Should state agencies generally be prohibited from paying more for any prescription drug than the U.S. Department of Veteran Affairs (VA) pays for the same drug? 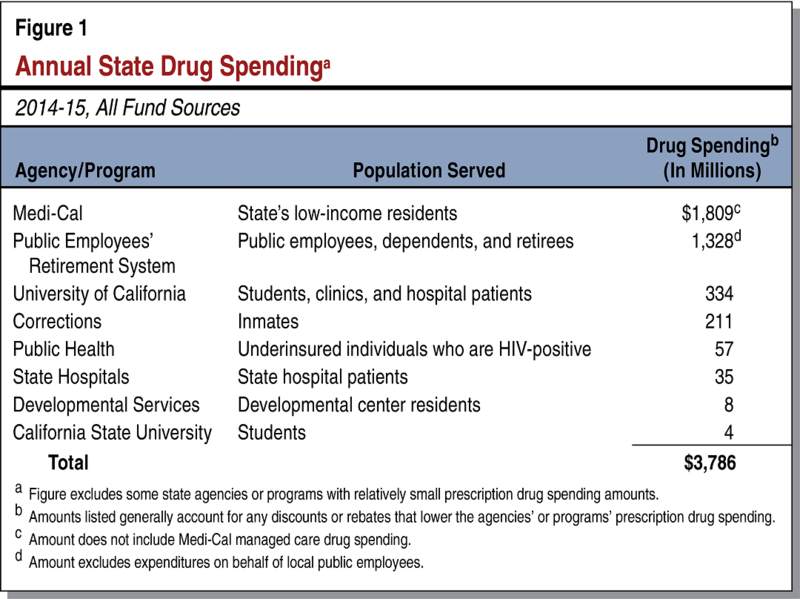 The state purchases prescription drugs under various programs covering current and retired state employees, prison inmates and Medi-Cal enrollees. The state (1) purchases some drugs directly from manufacturers, or (2) reimburses entities implementing state programs. Significant drug purchasers typically negotiate and receive price discounts. The VA provides health care to approximately nine million veterans nationwide, including prescription drugs. It is subject to federal upper limits on the prices it pays for drugs, and often negotiates additional discounts, generally achieving lower prices. The VA maintains a public database that lists the prices it pays for most drugs. However, the database may not display the lowest prices paid for some of the drugs because of confidentiality clauses in some purchase agreements. Prop. 61 would generally prohibit state agencies from paying more for a prescription drug than the lowest price paid by the VA for the same drug after all discounts are factored in. This would apply whether the state purchases directly, or indirectly through reimbursements. The state’s Medi-Cal program offers comprehensive health coverage to the state’s low-income residents. Prop. 61 would apply to its fee-for-service program, which serves approximately 25 percent of Medi-Cal enrollees, but not to its managed care system, which serves the remaining 75 percent. Prop. 61 would require the Department of Health Care Services (DHCS) to verify that state agencies are paying the same or less than the lowest price paid by the VA on a drug-by-drug basis. There is the potential for the state to realize drug cost reductions, but there are major uncertainties about the amount of savings. The VA’s database does not always identify the lowest prices it pays, and it may not be possible to obtain this information. Then DHCS would be unable to assess the lowest price paid by the VA for one or more drugs. Courts sometimes allow state agencies to implement laws to the degree that is practicable, such as by allowing the state to pay for drugs at a price not exceeding the lowest known VA price, but that is not certain. Drug manufacturers might try to raise the VA’s drug prices. Drug manufacturers could decline to offer California some drugs purchased by the VA. Therefore, the amount of any savings under Prop. 61 could range from relatively little effect to significant annual savings. Skyrocketing prescription prices are a matter of life and death. Prop. 61 will end the price gouging. Prop. 61 empowers the state to negotiate the same or better deals for taxpayers as are paid by the VA. Prop. 61 only covers an arbitrary group of patients in certain government programs; more than 88 percent of Californians are excluded. Prop. 61 would result in the elimination of drug discounts the state currently receives, increasing state prescription costs instead of reducing them. Prohibits state agencies from buying any prescription drug from a drug manufacturer at any price over the lowest price paid for the same drug by the United States Department of Veterans Affairs, except as may be required by federal law. Applies to any program where the state agency is the ultimate payer for a prescription drug, even if the state agency does not itself buy the drug. Exempts purchases of prescription drugs under managed care programs funded through Medi-Cal. Prescription drugs sold in the United States have list prices that are similar to the manufacturer’s suggested retail price (MSRP) for automobiles. Purchasers of the drugs typically negotiate the prices and often receive discounts. As a result, the final price paid for a prescription drug is typically lower than its list price. Prices Paid for Prescription Drugs Are Often Subject to Confidentiality Agreements.Prescription drug purchase agreements often contain confidentiality clauses that are intended to prohibit public disclosure of the agreed prices. As a result, the prescription drug prices paid by a particular entity, including a government agency, may be unavailable to the public. DHCS Required to Verify That State Agencies Are Complying With Measure’s Drug Pricing Requirements. The measure requires DHCS to verify that state agencies are paying the same or less than the lowest price paid by the VA on a drug-by-drug basis. how drug manufacturers would respond in the market. We discuss these concerns below. State agencies would generally be prohibited from paying more for any prescription drug than the lowest price paid by the U.S. Department of Veterans Affairs for the same drug. State agencies would continue to be able to negotiate the prices of, and pay for, prescription drugs without reference to the prices paid by the U.S. Department of Veterans Affairs. Drug companies making enormous profits from people’s illnesses and misery isn’t just a moral issue. Skyrocketing prescription drug prices are a matter of life and death. More Americans die of hepatitis C than from all other infectious diseases—EVEN THOUGH THERE’S A CURE. One reason? The drug company that controls it charges more than $1,000 per pill, out of most patients’ reach. The price of a common infection-fighting pill was raised overnight from $13.50 to $750—nearly a 5000% increase. The average annual cost of widely-used specialty drugs is estimated at $53,000—greater than the nation’s median household income ($52,000) and almost 3 1/2 times larger than average annual Social Security benefits of $15,000. One cancer drug costs $300,000 a year. The drug companies put profits over people, returns for stockholders over cures for patients. What good are miraculous, life-saving medications, if they’re priced so high patients can’t afford them—and thousands are dying as a result? Proposition 61, The California Drug Price Relief Act, fights back against the drug companies’ price-gouging. And it is expected to save lives. Here’s how it would work: The Act would require the State of California to negotiate with drug companies for prices that are no more than the amounts paid for the same drugs by the U.S. Dept. of Veterans Affairs (DVA). Why the Dept. of Veterans Affairs? Because unlike Medicare, the DVA negotiates for drug prices, and pays on average 20–24% less for medications than other government agencies, up to 40% less than Medicare Part D. The Drug Price Relief Act empowers the State of California, as the healthcare buyer for millions of Californians, to negotiate the same or even better deals for taxpayers, which could save billions in healthcare costs. Drug companies are planning to spend $100 million to fight this measure because they know it would cause downward pressure on ALL drug prices—and cut into their excessive profits. “If the voters of California approve this proposition . . . [it] would no doubt cause an immediate demand for the same VA discount rate to be made available to other states, the federal government, and likely private [health plan] entities, as well. IN SHORT [IT] WOULD BE A PRICING DISASTER FOR THE ENTIRE U.S. DRUG INDUSTRY. But a “pricing disaster” for drug companies would equal price relief for hard-pressed consumers. Prop. 61 is strongly supported by the 86,000-member California Nurses Association—the largest healthcareprovider organization in the state; AARP, the largest retirees’ group in California, with 3.3 million members; the Urban League; the Campaign for a Healthy California, including many labor unions; Progressive Democrats of America; Sen. Bernie Sanders; former U.S. Labor Secretary Robert Reich; and many others. JOIN US IN FIGHTING AGAINST HIGH DRUG PRICES AND DRUG COMPANY GREED. VOTE YES ON PROPOSITION 61. For more information, go to www.StopPharmaGreed.com. Proposition 61 is a deeply flawed and costly scheme that is not what it seems. Prop. 61 was written and is being promoted by Michael Weinstein, the controversial president of an organization that brought in more than $1 billion selling prescription drugs and HMO policies. Suspiciously, he exempted his own HMO from having to comply with the measure he wrote and is promoting. The Veterans of Foreign Wars, Department of California warns Prop. 61 would harm veterans. The California Medical Association, representing 41,000 doctors, warns Prop. 61 would reduce patient access to medicines. The California Taxpayers Association warns Prop. 61 would impose new bureaucracy, red tape and lawsuits—costing taxpayers millions. The proposition only covers an arbitrary group of patients in certain state government programs, including some government employees and state prisoners. More than 88% of Californians are excluded. More than 10 million Medi-Cal low-income patients, 20 million Californians with private health insurance and Medicare, and millions of others—ALL EXCLUDED. Prop. 61 would result in the elimination of drug discounts the state currently receives—increasing state prescription costs by tens of millions annually. The state’s nonpartisan Legislative Analyst says the measure could raise state spending on many prescription drugs. The California Taxpayers Association opposes Prop. 61. The measure is completely vague on how it would be implemented. Passage of this measure would result in more government bureaucracy, red tape and lawsuits as state agencies struggle to implement it—costing taxpayers millions. PROMOTER WROTE IN SPECIAL PROVISIONS FOR HIS OWN ORGANIZATION The proponent exempted his billion dollar operation and wrote in provisions giving him a special right to engage in lawsuits regarding this measure. This provision requires California taxpayers to pay his lawyers—a virtual blank check. Proposition 61 is yet another example of a misleading and costly ballot measure. It would hurt veterans; jeopardize patient access to needed medicines; increase state prescription costs; and add more bureaucracy, red tape and lawsuits—costing taxpayers millions. Leading experts have rejected proponents’ claim that Prop. 61 would somehow reduce drug prices. In fact, EXPERTS WARN PROP. 61 WILL INCREASE DRUG PRICES. The California Taxpayers Association opposes Prop. 61 because it would impose new bureaucracy and red tape, and cause countless lawsuits—COSTING TAXPAYERS MILLIONS. The Veterans of Foreign Wars (VFW), Department of California urges NO on 61 because it could jeopardize special discounts given to the U.S. Department of Veterans Affairs and INCREASE DRUG PRICES FOR VETERANS. Prop. 61 was written by Michael Weinstein, president of an organization that brings in $1 billion annually selling prescription drugs and operating HMOs. His group is spending millions to fund the campaign. But he exempted his own organization from its drug pricing provisions. He shouldn’t ask Californians to approve a flawed initiative he isn’t willing to comply with himself. The drug companies want you to believe they’re opposing Prop. 61 because it wouldn’t cover every drug purchase in California. That’s as laughable as the NRA saying it opposes an assault-weapons ban because it doesn’t cover enough different kinds of guns. THE DRUG COMPANIES ARE ONLY CONCERNED ABOUT MAINTAINING THEIR EXORBITANT PRICES AND PROFITS, PURE AND SIMPLE! Don’t be fooled by their expected $100-million campaign of distortion and mistruths. Voting against 61 only allows the drug companies to continue ripping off you and your family. ONLY PROPOSITION 61 ALLOWS ORDINARY CITIZENS TO FIGHT BACK AGAINST DRUG COMPANY POWER AND GREED. www.StopPharmaGreed.com.